How students spend time outside of the classroom—before and after school and during breaks and summer vacation—has a tremendous impact on what they achieve in school and in life. Quality expanded learning opportunities extend learning and positive youth development beyond the school bell and engage students who might otherwise be left behind. Our work in the afterschool and expanded learning field supports the creation, evaluation, improvement, and maintenance of high-quality afterschool and expanded learning programs in a variety of ways. provide state and national leadership in promoting policies that will create broader access to and support for high-quality afterschool and expanded learning programs. Research shows that when youth participate and engage in high-quality afterschool programs, they experience a variety of positive impacts: academic improvement, social and emotional growth, improved physical and mental well-being, and more. Through funding from the Mott Foundation, AIR supports afterschool network leads, their staff, and ultimately the programs in their states on topics related to afterschool quality. Join the American Institutes for Research’s Jaime Singer, Beyond the Bell director and senior technical assistance consultant, and our team of AIR experts every other month for a short webinar featuring one of the 96 tools available in the Beyond the Bell Toolkit. Hear from AIR experts on topics related to managing, designing, implementing, and improving quality afterschool and expanded learning programs. Quality expanded learning opportunities extend learning and positive youth development beyond the school bell and engage students who might otherwise be left behind. There are opportunities in ESSA for states to fund innovative programs to create, strengthen, or maintain quality extended learning opportunities. AIR's work in the afterschool and expanded learning field supports the creation, evaluation, improvement, and maintenance of high-quality afterschool and expanded learning programs in a variety of ways. Research indicates that afterschool programs can significantly improve youth outcomes in such areas as academic performance, student attendance rates, and incidence of disciplinary actions. The Texas Education Agency has implemented a number of state and federally funded afterschool initiatives in Texas, including the 21st Century Community Learning Centers Program, and has been working with AIR since 2007 to understand their implementation and impact. The expanded learning field continues to bring multiple stakeholders together to advance program quality and research. This article from the Journal of Expanded Learning Opportunities features a dialogue on the topic of program quality in expanded learning programs between Michael Funk, afterschool division director for the California Department of Education, and Carol McElvain, managing technical assistance consultant at AIR. What is summer STEM? Hands-on programs that teach science, technology, engineering, and math in ways that engage young people and fight the summer learning loss that especially affects the nation’s most vulnerable children and youth. In this blog post, Elizabeth Devaney and Courtney Tanenbaum share what we’re learning about successful summer STEM programs. How can we better support young people as they learn the skills they need to succeed in school, work, and life? 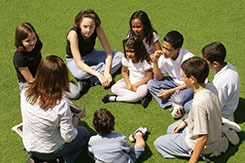 These resources focus on social and emotional development outside the classroom. Both the formal and informal education communities are increasingly focused on fostering opportunities for social and emotional learning (SEL) and the link between SEL and youth outcomes. This self-reflection tool is designed to help afterschool program staff reflect upon their own social and emotional competencies and their ability to support young people's SEL through program practices. What and How Do Summer Schoolers Learn? Years of research show that students from low-income families are more likely to forget previously learned material over the summer than students from wealthier families. Over time, these losses add up, widening the socioeconomic disparity in academic performances. Carol McElvain explains how high quality summer opportunities for low-income students can help combat this effect, particularly in math. School’s Out New York City (SONYC)—a pathway to success for youth in sixth, seventh, and eighth grades—offers afterschool programming for New York City (NYC) middle schoolers in a variety of activity areas. SONYC programs provide middle school youth with the support of caring adults and offer engaging, fun activities during the afterschool hours. AIR’s state and local evaluation projects marshal a broad range of expertise and resources to support state education agencies and district offices as they decide whether to retain, revise, or end a policy or program. The projects address challenges in district and school reform, educator quality, special education, school financing, STEM, literacy, virtual learning, extended learning, English learning, early childhood education, and college and career readiness. How can afterschool and expanded learning practitioners measure young people’s personal and social skills? How can they use that data to improve their programs and systems? To answer these questions, AIR worked with Every Hour Counts, a coalition of citywide organizations that increase access to quality learning opportunities by providing learning and enrichment through afterschool, summer, and other initiatives, to develop a framework that identifies priority outcome measures for expanded learning systems to track at the youth, program, and system levels. Research shows that afterschool and expanded learning programs work best when they are high quality and evidence-based. 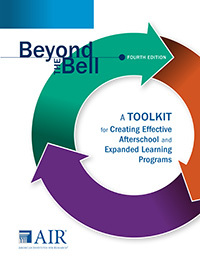 Beyond the Bell ® is a suite of professional development services, products, and practical tools designed to help afterschool and expanded learning program leaders and staff members create and sustain high-quality, effective afterschool and expanded learning programs. The newly updated 4th edition was released on May 21, 2014 and has been revised to focus on a cycle of continuous improvement. Long Story Short: Why Are Expanded Learning Programs a Good Investment? Expanded learning opportunities offer supports and programs for youth outside traditional school hours, including during the summer. 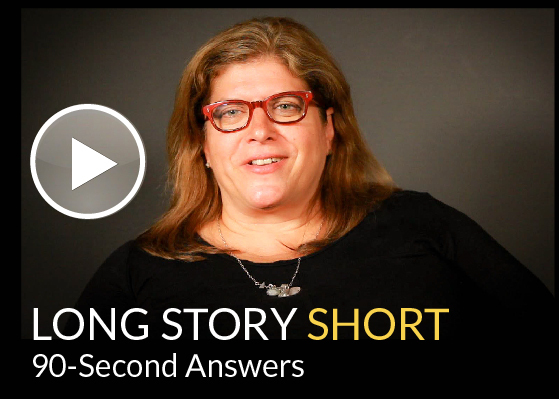 In this video interview, Carol McElvain, AIR principal technical assistance consultant, explains how such programs can reinforce learning overall and help prevent summer learning loss. Over the last two decades, the expanded learning community has grown and developed, both in its day-to-day practice as well as in its knowledge of what works well. This article, written by Carol McElvain, a managing director at AIR, focuses on what the development of a robust program quality indicator system might be able to measure and demonstrate to those who might support the expansion of high quality expanded learning programs afterschool and summers. Research suggests that students strongly benefit when they are provided substantially more time to engage in academic enrichment and youth development opportunities, both within and outside the school building. This report offers practitioners support in their efforts to integrate high-quality, expanded learning opportunities in state, district, and school reform initiatives. With more than 400,000 students served by afterschool programs in California, the State of California has good reason to focus on the quality of its afterschool programs. SEDL, now an affiliate of AIR, worked with the California Department of Education to identify high-quality afterschool programs in the state and to establish technical assistance based on the promising practices of the programs identified. SEDL then worked with the identified programs to develop training and resources used to support other afterschool programs in the state. The best afterschool programs do two things: they engage students in fun activities that create a desire to learn, and they build on what students are learning during the school day to extend the knowledge they already have. This online toolkit provides resources for developing fun, innovative, and academically enriching activities for afterschool and expanded-learning programs. The toolkit includes videos of promising practices and sample lessons in the arts, literacy, math, science, technology, and homework help. Since the implementation of the No Child Left Behind Act, a greater emphasis has been placed on academic development during the afterschool hours. Research has found that students’ participation in afterschool program is beneficial to academic achievement and social adjustment. 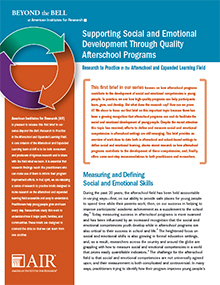 This report shares the findings of the five-year study conducted by the National Partnership for Quality Afterschool Learning. The study identified and documented practices among high-functioning 21st Century Community Learning Center programs in six content areas: the arts, literacy, math, science, technology, and homework help.